Wil Time Bigtime host Willie Revillame, with lost voice and not feeling well, and mourning for the demise of King of Comedy Dolphy, filed a leave from his show. Willie, however, personally chose an able host in Marvin Agustin to pinch-hit for him. Marvin, who is a respected actor, entrepreneur-restaurateur, cleared all his previously-set engagements to respond to Willie’s request. Marvin started hosting Wil Time Bigtime yesterday (July 11) and will continue doing so until tomorrow(July 13). 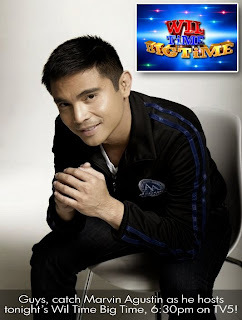 "I really enjoyed my first night hosting Wil Time Bigtime," says Marvin. "Kaya naman pala masayang-masaya si Kuya Wil sa show niya dahil nakakapagpaligaya ka na, nakakatulong ka pa kaya I'm looking forward to doing this till tomorrow."